It is almost Halloween! I love Halloween... although it is second to Christmas on my favorite holiday list, it is a close second. I haven't actually gotten to decorate yet, which is very sad (I have been SO busy!) but we are decorating Monday after my big toxicology test so that will be lot of fun. Anyway... the next week and a half are going to be totally dedicated to Halloween manicures! First up is a manicure I did with the gorgeous China Glaze Haunting, a black filled with tons of silver microglitter fron their Halloween 2011 Haunting collection. I have been wanting a black and silver glitter for awhile now and I knew this was the one as soon as I saw it! Fabulous application at two coats. On top of that, I added cute little ghosts from BM-223 using Zoya Trixie. These ghosts are just too cute, and the silver looked very nice with the silver glitter. A very fun first Halloween 2011 manicure! gorgeous polish! when i'm less broke i am totally gonna get it! I love these. Finger Paints Where Art Renoir? 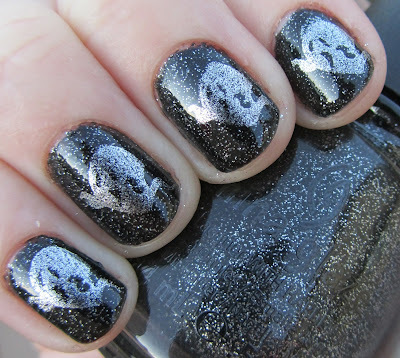 is a similar black with silver glitter, but I hadn't thought about using it for a Halloween mani.